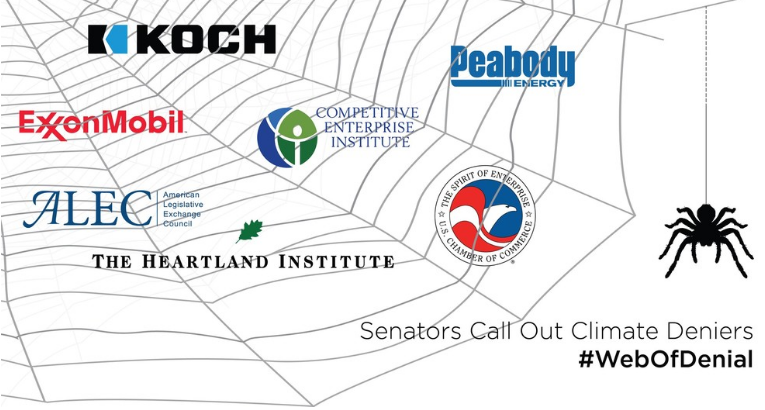 As Democrat Senators spent two days this week outlining the cash funneled to front groups in the fossil fuel-funded climate "Web of Denial," predictably, some of the spiders started crawling out of that web. 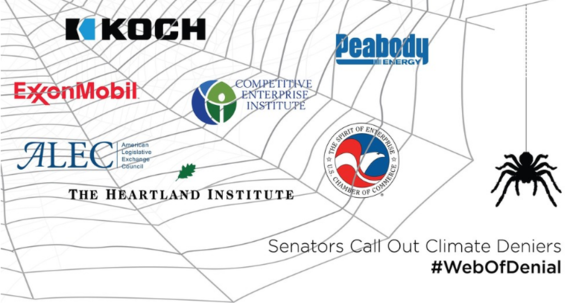 The senators received a sharply-worded missive from a line-up of 22 free market groups, 21 of whom have received money from fossil fuel companies - or "dark money" (money laundered to hide the funders), and the majority of whom are fighting climate action - or the science. The total funding added up to more than $92m. "Sadly, our democracy and our freedom hangs in the balance as you use your office to bully and single out groups to blame rather than ideas to debate," they lamented. The American Citizenry "deserve and increasingly demand healthy and respectful political dialogue, and well-informed, well-debated public policies." The letter, hosted on the American Legislative Exchange Council (ALEC) website, started off reasonably politely, but quickly turned nasty as the writers accused the Senators of being tyrants, of shutting down free speech, yada yada yada. In the interests of democracy and transparency, we decided to take a look at these groups. 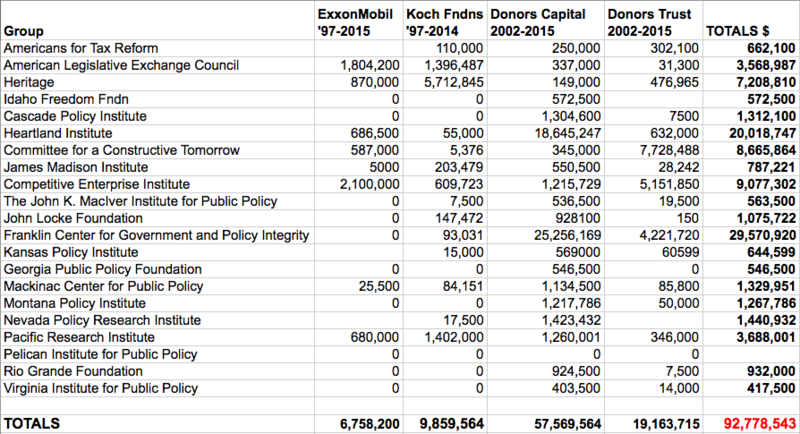 We tallied up the funding they've received from just four entities since the late 90's: the Koch Brothers' various foundations, ExxonMobil, and the two Dark Money organizations, Donors Trust and Donors Capital Fund. The total tally of funding came to over $92 million to 21 of the 22 groups that signed the letter. Not all of this (that we know of) went to climate denial specifically, because we don't know the details of why Donors Capital Fund gave them a total of $57,569,564, or, indeed, who provided the DCF with that cash. 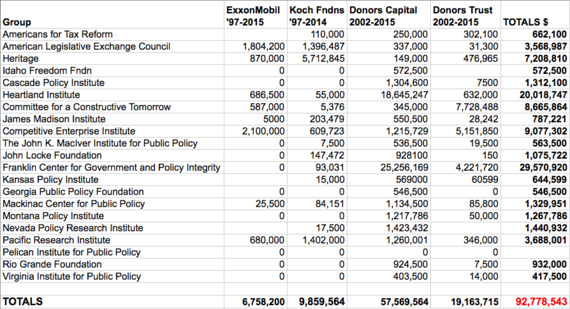 Neither do we know the details of Donors Trust, which provided $19,163,715 to these groups. But at least some of it, we know, was for these groups' fight against the climate science - or against action on climate. And all but one of these organisations have been working to either undermine the climate science, or to prevent action on climate change, either at State or a National level. "You were elected by the people to build consensus and find compromise--to fiercely debate the most pressing issues of our day. Often, these debates are meant to be contentious and without a clear solution because innovation comes from great challenge," they told the 19 senators. Yet many of them have worked fiercely to oppose any solutions to arguably THE most pressing issue of the day: climate change. For example, ALEC has written model bills and resolutions designed to undermine - or kill - innovation such as renewable energy. These groups have challenged the scientific consensus on the climate science, and blocked progress at state and federal level to curb emissions. Then there is their insistence on debate. Many of this lot use the "doubt is their product" tobacco playbook - keep the "debate" going so that the public thinks there is a debate over climate science. That this debate is over doesn't stop them. So writing to the Senators complaining they are shutting down debate is pretty much what you'd expect them to do. Let's break down the funding a little more. The Heartland Institute received a total of 18,645,247 from Donors Capital Fund, and a total of $20,018,747 from the four of them. That's an enormous amount of money. Heartland staff have given presentations at ALEC annual meetings. ALEC itself has received $3,556,487 from these four funders. The Franklin Center for Government and Policy Integrity has received a total of $29,570,920- mostly from the Donors Capital Fund and Donors Trust. Its affiliated news outlets regularly publish articles questioning climate science and parroting long-debunked myths around climate change. The Competitive Enterprise Institute, of course, is on the list. Again, a big recipient of Donors Trust money ($5 million), and it still coordinates the Cooler Heads Coalition, a group that's been going since the late 1990's. Then there's the money that we haven't tallied. For example, the John Locke Foundation, according to Robert Brulle and spelt out by Sen. Jeff Merkley (D-OR) in the debate, received $21 million from Art Pope's father's foundation 2003-2013. Art Pope is a good friend of the Koch brothers. So in the end, one looks at these 22 organisations who've slammed the Democrat Senators' speeches in the house, and you can only conclude one thing: they would say that, it's the kind of thing they're paid to do. Here's the full details of the funding to these groups.